Current government studies show the dangerous and dominating effects of technology and social media on today's children, the creators of childrento were determined to find ways to express their creativity and get offline. Kid vs Paeleontologist engages children's imagination through science. By trying to combat the disintegration of traditional childhood developments of creativity and imagination. "Children are natural artists, they have an inbuilt ability to express themselves using art materials without censorship or concern about "doing it right". It is our responsibility as adults to foster that precious unadulterated creative skill in our younger generations." Kid vs Paleontologist saw a large number of UK children design their own dream dinosaurs in any artistic medium they desired. Through careful selection, we then took the 5 most innovative designs and brought them to life. Dougal Dixon, paleontologist, whose work has inspired the likes of Peter Jackson's King Kong, gave the dinosaurs scientifically grounded origin stories whilst bringing them to life through digital illustrations. "This is a fantastic project which has shown these young children that their artwork, their imagination and their dinosaurs are valuable; and they have been brought to life... what greater form of creative encouragement could there be?" With this in mind, we started thinking, what else could we, along with parents, teachers, and carers, do to encourage imagination and creativity in our children? Children's imaginations are active all the time and it's extremely healthy to help them act out some of their thoughts through role play. It's important not to put them down or brush off any ideas as it helps them to explore and get as creative as possible. If a child can see and touch their imaginary world, they're more likely to engage with it, develop it, and explore more creative ideas as a consequence. This could be anything from household items, such as non-toxic finger paints and markers, to clothes and hats for dress up! Make sure you provide safe supplies, eliminate choking hazards and keep the environment safe - but not stiffled. Whilst our project was art focused, it's important to get your children reading from an early age. It's a great habit to let them read on their own, as well as enjoy nightly bedtime stories with you. This instills a sense that reading is a hobby and is also a great way to get them to relax at the end of the day. Get your child's imagination flowing by playing different kinds of music daily. 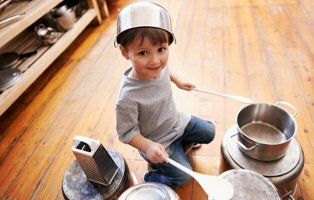 Mix it up by exploring different instruments, or get even more creative and turn household objects into drums and symbols. Encourage your child to make their own songs, sing along, and dance along to the rhythm! Who doesn't love an impromptu dance party in the kitchen? Let your child's creativity soar into far away worlds where anything is possible. Use words, pictures, roleplay, or anything you have to hand. You don't always have to rely on books - lead by example and create your own stories to foster your child's own creativity. Make a walk around the park an adventure, and come up with items for them to find as you go! Play eye spy on long car journeys, and challenge them to spot things along the way. These are very simple ways to keep your child's mind engaged, and never let there be a dull moment! Don't just let your child ask you questions about the world, ask them back! Find out their thoughts, let them improve their vocabulary and verbal communication skills through explaining their thoughts and feelings. Let them make guesses about how stories or jokes will end, and further their inventive capacities. By allowing children to play with sand and clay, there's no limit to what they can transform and build it into. Similarly, water can also stimulate a child's imagination, whether they are splashing around in the ocean or pool, or playing with basic bath toys in the tub. Even an empty shampoo bottle can make the perfect sailboat with the right imagination! Let your children's imagination run wild through art! Whether it's drawing, colouring, painting, or model making, there are endless possibilities for how children can express creativity through artistic expression. Let them use different mediums and supplies, including their own fingers and toes, to create anything from a self portrait to even mythical dinosaurs. Keep your child's imagination alive through the encouragement of creative activities, but never make it mandatory. Children learn and develop at different times and at different speeds. Some may not enjoy imaginative projects or activities yet, and that's okay. More importantly than anything else, we want younger generations to enjoy using their imagination as a fun process and activity, not as a chore to be endured. "With a thriving imagination and access to art materials, children can conquer the world! Creative expression is a prized means of communication which can enable children to develop their own world in which their ideas come to life. Artwork can even be used to access areas of the brain which do not have neurological links to verbal expression and would be otherwise unexplored. Creativity is a vital language!"